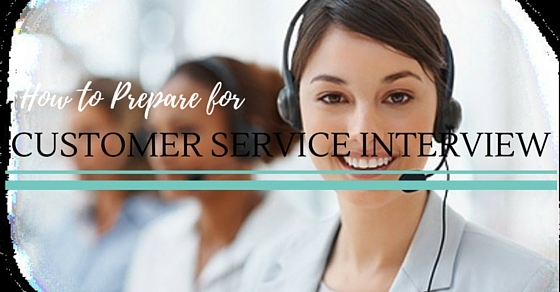 How to Prepare for Customer Service Interview? Dealing with the clients and keeping them happy is the most important aspect or task for any organization. The whole process either in manufacturing or service business is related to the customers who make use of the outcomes. There is a whole sales force that is dedicated to keeping these customers happy. The customer service person is the face of every organization and when they are hired a good quality assessment is made for them. Preparing for these interviews becomes easy when you know what are preparing for. Since the customer service is an important profile the companies ensure that a highly apt and positive person is hired for the job. Thus, there is a need to focus when preparing for the customer service interview. It is not very difficult but calls for an open mind and preparation. Whenever there is a customer service interview the prerequisite is to find out what the company expects you to deliver. This is not a difficult task, learns about the products or services the company offer and gather information about them. It is not that you are expected to know about everything product or services but this will show that you are interested and already a little ahead of the rest. The interviewers can then skip the obvious questions and move ahead with a meaningful interview. The interviewers are often seen looking for candidates who have a fair idea about the company as it gives them the surety that they know what they are getting into. The company’s information thus becomes the first thing they should look into. When one is preparing for a customer service interview then these are the most important questions that one must prepare. They are generally the once around which a lot of discussions is being done. It is always advised that one should prepare for the interview. Having a preparation around these questions will also make the interviewee feel confident and help them carefully put their thought forward. 1) Who have you interacted with? This question can be re-framed and asked in thousands of ways. The idea here is to see whether the interview has been able to memories and keep track of the people he has met or communicated in the organization. The situation here to see whether the interviewee is apt enough to keep the names of the customers, also here another important point is that the organization also sees what process is followed in doing so. It is a great way to create an impression on the interviewer if this question is handled carefully. Since the job requires a huge interaction within and outside the organization this is an important skill one must have or at least develop. Mostly the conversation takes interesting turns from here. 2) What was your last job? What did you like there? What did you not like? This is another important and tricky question since customer service generally involve interactions and a huge amount of information sharing, it is one of the most stress giving role. The employees who are not able to handle this kind of work pressure get in the trap of not being able to fulfill the job requirements. The question is aimed to highlight if there has been any such incident with the employee in the job. It also shows if the employees contradict their own answers. Since the question ask for both like and dislike, these things should be poles apart and not just closely similar to each other. The answer should be direct and simple and if asked the employees reasons then interviewee should just add little information which is one of the incidents that happened. 3) What things do you not like about the last product that you sold? It is not an opportunity to start saying bad things about your earlier product!! The question is aimed to understand what could be probable issues that the candidate might find here. The interviewee should be prepared with the answer. The answer could revolve around any issues that were genuine and the company was looking into or something that created difficulty in selling the product. It should be added that the candidate did take necessary steps to ensure that even with that the product was sold by them and also that they did inform the company about the issues so that it is resolved at manufacturer level or training level. The question is a good opportunity to show that you are self-aware and always ready to work towards creating a solution. 4) What do you do when you do not know answer? The customer service workforce deals with various queries day in and day out, there are always cases when the service executives are faced with issues they do not know how to resolve. This is a difficult situation when faced with a customer. The question around it is asked in an interview to know what candidate would do, it looks for the presence of mind, tone, response, panic reactions etc. The idea is to see what course they take. The situation can take many directions, the interviewer should look for a suitable course so that the customers are satisfied that they will get a suitable response. It is never advised that the representatives say that they do not know, always a good way is to say that you will take some time and get back to them. But even this simple answer skip our mind when answering or the same in an interview. 5) What will you do If the product is really bad and the customer is complaining about it? This question is asked to see what candidates’ response is when the company is at fault. There are times when mistakenly faulted products make their way to the customers. Sometimes there are technical errors which are faced after use of the product, the customer service executive is the point of contact in such situation and definitely, the customers are not happy with the situation. Here the best way to ensure that the customers are not harassed and they are comforted. The interview question is aimed at looking whether the employee shows any compassion and apologizes on the company’s behalf? Whether they assure them that a strong process will be initiated to ensure that rectification is done. The customers do not want a rude behavior especially when they are already troubled. Mostly employees forget to be kind or compassionate in these cased which creates problems. The list of question is long, but the general idea is to show that the representative is focused on providing tin the moment support to the customers. The candidates while preparing can use their prior experience if any to create a series of questions and work around them too. The employers here are often seen making a choice between someone who is interested and well prepared against someone who will require a lot of training and preparation. The job of customer service candidate involves a lot of off face interactions which may lead to a laid body language and conversation. One must ensure that this is not the case in the interview. The employers are looking for someone who is interesting to communicate with and if they see an uninterested person they will not like it. Also, every interview has more candidates compared to the job available. If the situation of an uninterested looking employee arises the interview may not even continue which means that you do not even get a chance to share what you have come for. Candidates who are very passionate are known to appear aggressive when speaking. This does mean physical aggressiveness but verbal. It is always advised that candidates prepare well and put their answers forward politely yet firmly. There is a very thin line between them and the candidates must ensure that they do not cross the line. The job requires candidates who are knowledgeable and polite and not at all aggressive as they will be dealing with customers who are troubles with the products. When a polite support is provided it solves half of the problems without efforts. The answers in an interview are directed towards a particular skill the interviewer is looking for a candidate. Also, the time is limited for every interview; a longer interview does not mean a good interview. The candidates must ensure that they are giving apt answers, honoring the time of the interviewer. The candidate must ensure that the answer is given and if they think they have given an appropriate answer it always best that it is not to extend the conversation. If the interviewer asks for more then they should add additional details. This is contrary to the previous mistake. If the candidate speaks too less they may not be able to get their thoughts right. The interviewers generally probe for more but they will not go on doing it. Also, it creates an impression that the candidate will not be apt for the role as customer service requires someone who could ask questions and talks a little more to find out the real issue. The candidates thus have to show that they can talk and carry on meaningful conversations that the job requires. It is a very common mistake which happens when the candidates jump the steps and starts answering even when the question is not finished. Also, there could be cases when the candidates do not get the question right and yet in order to form an impression they answer it with the little understanding they have gained. This could be fatal, always ensure that the question is understood well and appropriate answer is given. If the clarity regarding the question is missing ask the interviewer what they are actually asking for. The mistake of saying anything in the interview leads to a situation when the interviewer will feel that you are not a right candidate as when the same mistake is repeated in front of the customers, it could lead to a list of unhappy customers. Every company has different products that they sell and customers list is also varied. Mostly candidates when preparing for the interview miss out on finding these details. They just take an overview of the company and not get in detail of it. This means that the half information will also be of no use. The candidates should get in touch with the employees to find out about the kind of products they offer and what kind of services are provided, this will be a better way to prepare. Added to this the company’s information will show a highly prepared candidate. The customer service role does not have any set skills expect for the personal skills that the employees will be using on the job. The interview thus is inclined towards these traits. The candidates should be honest and open to feedback which will make them learn more even while the interview is going on. The companies always look for a candidate who can find solutions or the best possible way to manage the situation which is different for each person. Hence, there is no right or wrong answer in such interviews. The candidates must remember that they are reaching a point where they show traits which are positive and which will add value to the organization. The interview is a great platform to show the employers that you are just about right for this job.